Max's nursery is our cozy spot- dark blue/navy with gold accents and animal-themed artwork. Inspiration for color: I fell in love with Land of Nod's Between a Rock and a Lamp Base gold lamp which started the gold theme. I collected vintage and new gold frames for the artwork, spray painted a few things to keep the theme going. I love dark rooms, so navy seemed like a perfect pair with gold. Barnwood frames mixed with gold make an eclectic look. Inspiration for artwork: I love love love Sharon Montrose photography (the steer horn photo above the crib). That began the animal theme. I did a few DIY's and found wonderful art on Etsy and Land of Nod. Modern, eclectic, and thoughtful details. Vintage, DIY, and Target finds mixed with a few pricey pieces keep me on budget and make the room look special. All links and details on my blog, loveandlion.com. If you have any questions at all, I'm happy to share! The gallery wall of art is my favorite focal point of the room. Max looks up at all of the different colors and textures when I feed him. It'll be fun to teach him each and every animal sound while looking at the wall. 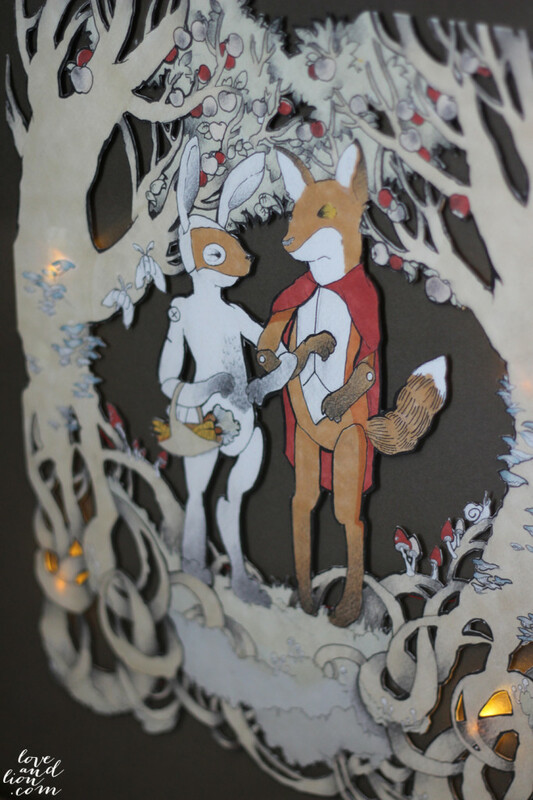 My sister's friend made us the fox and rabbit cutout with has LED lights in it! A charming little detail! Use different mediums and textures in the artwork- photography, painting, sculpture, needlepoint, paper cuts. A dark color in a nursery makes a bold statement! I think it makes the room super cozy! Love! Dark and navy nurseries on trend for 2014. And you executed this design beautifully. Thank you for sharing! LOVE this room! Do you mind sharing the paint color?? Where did you buy the brown wide chest with baskets? Could you Please please tell me what paint you used? Thank you!